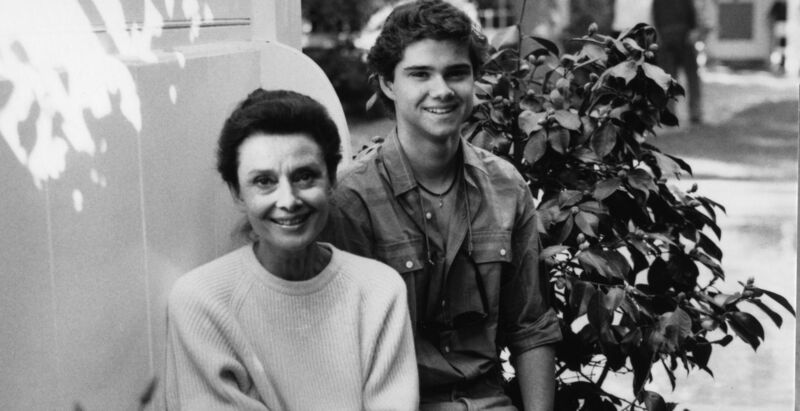 Twenty years after Audrey Hepburn passed away, we remember the legendary actress and fashion icon in this special interview which one of her sons, Luca Dotti, offered us exclusively. For the first time in the Romanian media, Dotti fondly talks about his mother, recalling the „very normal and happy childhood” she offered him, and manages to draw a candid and authentic portrait of the beloved star. I had a very normal and happy childhood, and for that I have to thank to my mother. When you are a child, you find it natural to be like this, but as I grew up, I understood much better my mother’s role in keeping this normality, without making the usual Hollywood fuss that exists in celebrities’ lives. There are so many stories that you hear today, about the stars’ lives being so special in so many ways. They live in a special way – either isolated, or with dramas… I had a very normal childhood, between Rome – because my father was Italian – and Switzerland, where we had a country house. And I am very grateful to my mother for that. It sounds unusual, because when you were born, at the beginning of the ‘70s, Audrey Hepburn was already famous. How do you think she managed to maintain this lifestyle? It’s something that had a lot to do with her education; she never saw herself very much as a star and she regarded her acting career as her job. She never wrote her biography because, she said: I have a very boring life. And I think it’s good. Today many celebrities promote extreme life – extreme diet, extreme sports, extreme fashion or expenses… So I think it’s a good thing she had a quiet life. She saw her career as she was going to the factory every morning. She considered herself very lucky to work with so many talented people – not only the actors and directors, but also the hairdressers and the make-up artists. But, in the end, what she said was that she was going to work. So you never had the feeling you were living with a star in the house? Not at all. It took me a very long time to understand that my mother was a star, because she didn’t act like one, she never told me or anybody else that she was one. She had such a natural behaviour. Now, that I am 43 years old, I understand this is the way to keep the balance: stay true to yourself and act normal. Her main desire was to have a family and to raise children. She had a very good background, a good education, and I think she learnt this at home. She wasn’t a woman of excess. Nowadays, what we see about celebrities in the media is that they are either very secluded, or too much in the limelight; it seems so difficult for them to have a balance. My mother always tried to have a normal life, and that’s what she also wanted for her children. Do you think her lifestyle had also to do with the fact that the media was different those days? You are right, it’s part of the reason. Compared to the present days, things were a little bit clearer. Today everybody is an idol. Of course, back then there were stars who were very much in the media. Marilyn Monroe, James Dean, Elizabeth Taylor had dramatic lives, with stories of marriages and divorces; there was a lot of controversy around them. Marilyn Monroe and James Dean died very young, in tragic circumstances. But my mother was around and she didn’t have such an interesting life to talk about. It’s funny that her image became larger after she died, and it continues to grow now, that she is not alive anymore. But mostly, it has to do with the way she lead her life: being in Hollywood, but in the same time living in Italy and Switzerland, going to the shops, doing normal things. Of course, there were always the paparazzi, the press wrote stories, but many times they would make them up, because there weren’t any. You know, it’s the journalists’ job to find something wrong. They thought that if she wasn’t living a glamour live, it was because she was depressed. But she was happily living her family life, which was so much more important for her than her career. In the ‘60s, she took a break from acting to raise my brother (e.n. Sean Hepburn Ferrer, the actress’s son with her first husband, actor Mel Ferrer). And then she stayed home to raise me. Exactly. I was born in Switzerland, in that house, and I spent a lot of time there. One of the reasons she wanted a house there had roots in the drama she lived during the Second World War – the loss of her home, of many friends and relatives. In those times, for a few years, they suffered a lot from food shortage. She liked Switzerland for many reasons, but the main one was that this country always managed to stay neutral during the wars. She was very scared by the war – not for herself, but mostly for her family and especially for her children. What else made her feel good in Switzerland? It was the way they treated her and other guests in their country. People there are very private, they have this philosophy of not displaying their wealth in an aggressive manner, and this made my mother’s life very easy. She had worked a lot and she took a break from her career, and La Paisible was her quiet spot. She had very good friends in Hollywood, but she didn’t live her life in the usual Hollywood style, that wasn’t her attitude. I guess this was because she was humble and didn’t consider herself a star, as you said. Yes, it has to do with the way you perceive yourself. She never considered herself nore a star, neither such a good actress. She was always very cautious and she used to say: I don’t know why they are picking me for roles, I’m not that talented. She had a great admiration for all her partners – Cary Grant, Peter O’Toole, Fred Astaire. But she considered acting just a job. She would say: This is my work, this is my opportunity, I have to study and do my best. She always thought that the persons she worked with were the reason why she was appreciated. She didn’t think about going on the set and act like she was a genius. Quite the contrary. But again, this was the influence of the way she was raised by my grandmother (e.n. Baroness Ella van Heemstra). She was a very strict, old-style woman; very international, very open, but from her point of view, the Hollywood scene was a bit mischievous. It was a little bit scandalous to be in the movie business. Of course she was delighted to see her daughter became a star, but at the same time, she influenced her with this conservative mentality, and my mother always kept it. So she became very aware of her great chance – that’s how she saw acting – being able to work with fantastic actors and directors and fashion designers. She always said: I was so lucky to be the right person, at the right spot, at the right time. She didn’t have this star attitude; this is the main reason why people still relate to her. My mother is an anti-star in many ways. She didn’t have these sensual features, like Marilyn Monroe, so she was much more similar to all the girls who had been through the war. And through the roles she had in movies she always tried to have this kind of approach. Until, of course, Breakfast at Tiffany’s. She didn’t want to do the part, because she saw Holly Golightly as being too far from her. And it’s a well known fact that Truman Capote himself didn’t want my mother for the role. Exactly, he wanted somebody in that tone. And the great genius was the director, Blake Edwards, who managed to put my mother and Holly Golightly together and transform Capote’s story into a script which was much more suited to my mother, in a way. And there was also the fashion, it was a significant part of the project. She and designer Hubert de Givenchy had already been collaborating for a few years, isn’t it? How was their collaboration? Yes, she had met Hubert de Givenchy before Sabrina. He was a fantastic designer, and together they created this fashion fascination that lasts to this day. There is one very sweet thing he said about her; when people asked him if she was difficult to satisfy, he said: No, she was the best customer I ever had. My mother would go to his studio and just pick something from his collections, without having any special orders of any kind. One thing she would always do was to take things away from the clothes; if there were too many decoration elements, flowers or sequins or beads, she would take them off. I think it was the influence of her Protestant upbringing. And she appreciated real luxury, which was different during her time. These days, luxury is about spending money on these famous brands that everybody wants to have. But my mother said: In my youth, luxury meant being able to buy very good products. So, if yo have some money to spend on shoes, buy some that would last for many years. And if you look at some of the big brands, that’s what they are trying to do now – turn back to their old values and offer people quality products that last in time. If you were to sum up your mother’s philosophy about fashion, what would it be? There is something funny she used to say about her style: that she dressed like an English gentleman. Usually, a man has two or three jackets that suit him, he doesn’t need so much fashion to make changes every day. This was my mother’s philosophy regarding fashion: when you find something that suits you, you should stick to it. Never go crazy about following the fashion and buy everything that comes out, but rather stay true to what compliments you best. And that’s what she did for the rest of her life. Yes. She always wanted to be confortable. When she didn’t have to go out to any special event, she would wear jeans and a T-shirt; I always remember her like this. I often see photos of her dressed very elegantly, but I remember my mother in jeans. That’s how I also saw her in many of her UNICEF campaigns. Yes, she dressed very simply. She was a woman, she loved to dress nicely, but when she traveled for UNICEF, she would travel in hot weather, so she had to pack and dress lightly. She was a very practical woman.